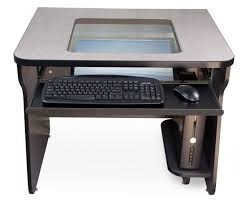 Glass Top computer Table, the monitor is submerged in the table. Monarch Ergonomics India Pvt. Ltd.
A Computer Table of Tempered Glass Moulded. It comes with CPU Stand, Printer Stand. 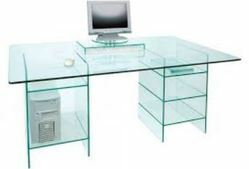 We offer extensive range of Glass Top Computer tables. These are manufactured by using best quality of glass in compliance with the market trends & requirements. Available in varied sizes, finishes and specifications. our products are globally acclaimed for their durability, anti corrosive nature and excellent finishing.